The new ULTRA simmer's headband with ULTRA Grip, ULTRA Comfort and Ultra Strength. Designed to hold ear plugs or ear molds in place while engaging in water activities. Extra durable 4mm neoprene with adustable Velcro type closure. Ear Band-It's unique design offers ultimate comfort and protection for the ears. 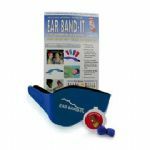 The patented Ear Band-It ear protection system was developed by a board certified Ear, Nose & Throat Physician, and is recommended by specialists worldwide for children with ear tubes and reoccuring ear problems. 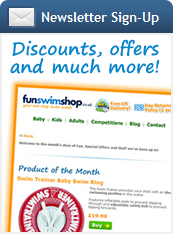 Water enthusiasts of all ages will also appreciate using the Putty Buddies earplugs and Ear Band-It headband in the prevention of swimmer's ear. Extra durable 4mm neoprene with adustable Velcro type closure. Is the Ultra really better than the Original Ear Band-It? Yes, although the Original Ear Band-It is an awesome product. It performed great the last 20 years but it was just time to make improvements based off all the knowledge we gathered from Original Ear Band-It users. The Ultra has better grip, comfort, and strength. If you want the best possible headband on the market... go with the Ear Band-It Ultra. Is the Ultra reversible like the Original Ear Band-It? No, due to the patent pending Grip-Tek neoprene inner lining the Ear Band-It Ultra is not reversible. Is the Ear Band-It Ultra waterproof? No, neoprene is not a waterproof material, although it will keep the majority of water out of the ear canal. The purpose of the band it to hold ear plugs or ear molds in place to form a watertight system. The Ear Band-It Ultra should not be worn by itself if the intent is to prevent water from entering the ear canal. 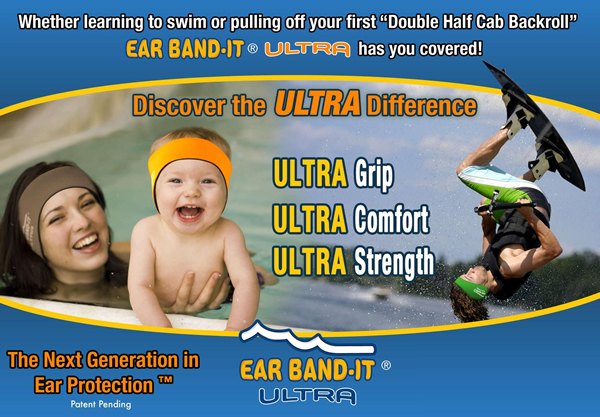 Can you dive with the Ear Band-It Ultra? 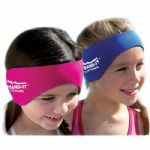 We do not recommend diving head first with the Ear Band-It Ultra as the band may come off the head. However it does have the best grip of any swimmer's headband on the market. It is much more likely to stay on during vigorous water activities. Swimming and jumping in the water feet first are not a problem.